The farm text was composted for a few weeks and left to dry out. The covers were prepared with hide glue and compost. 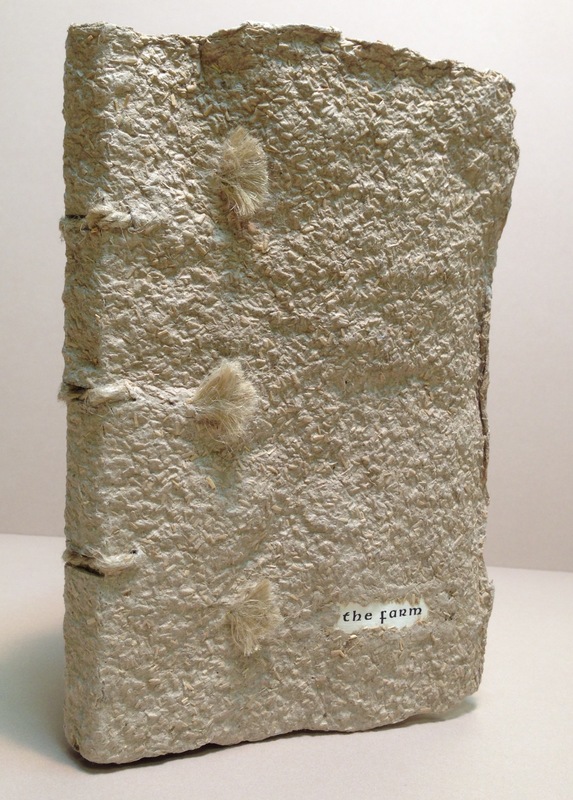 The text was sewn on goat parchment slips with hand spun flax thread. 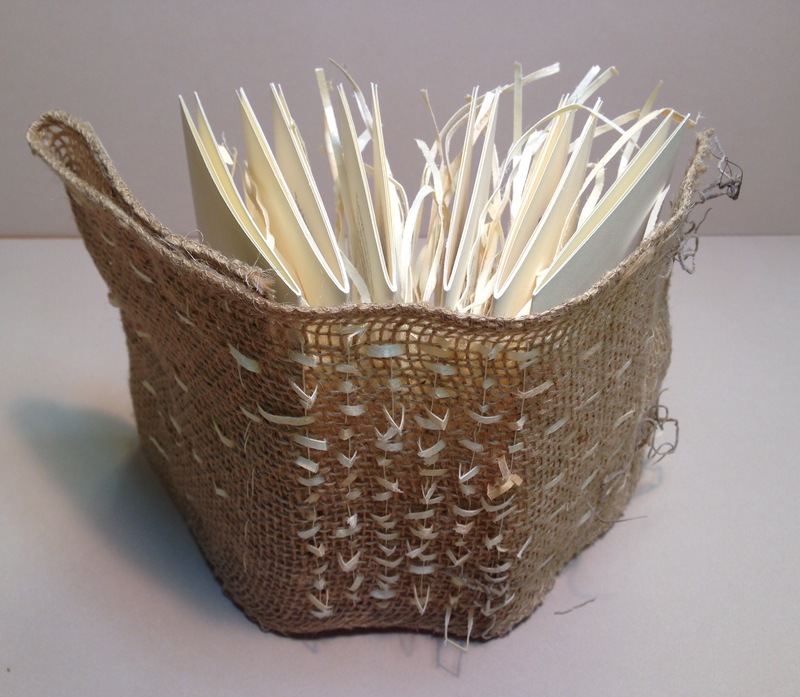 The spine bonnet is shaped from goat parchment and attached to the boards using a split style. 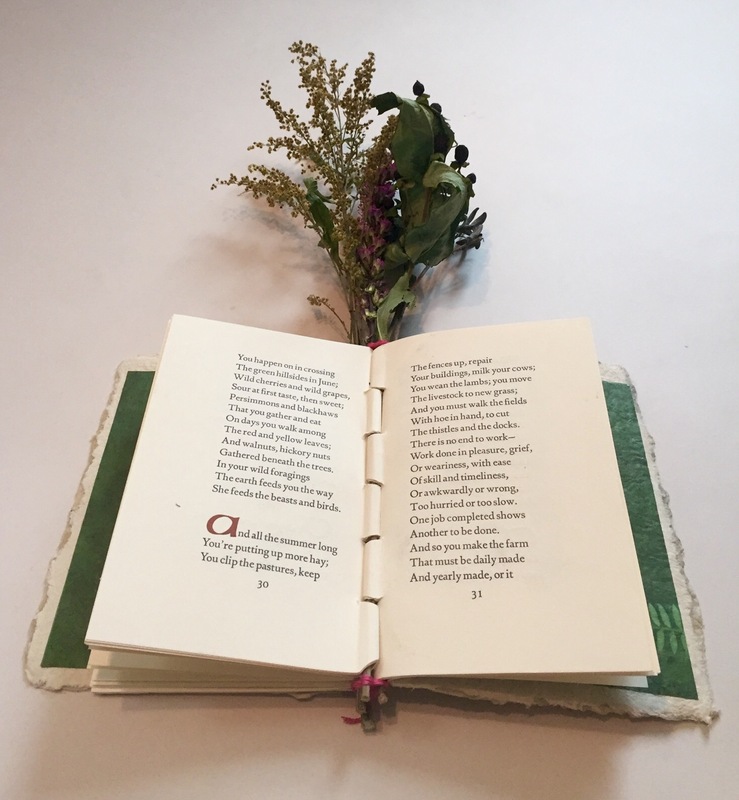 The parchment slips interlock the text to spine bonnet. 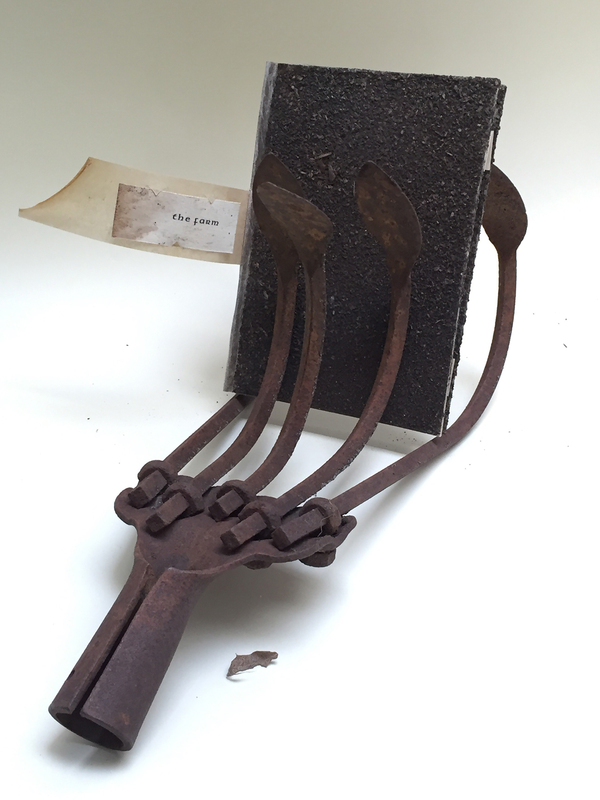 A vintage hand cultivator 5 tine claw farmers tool supports the book. 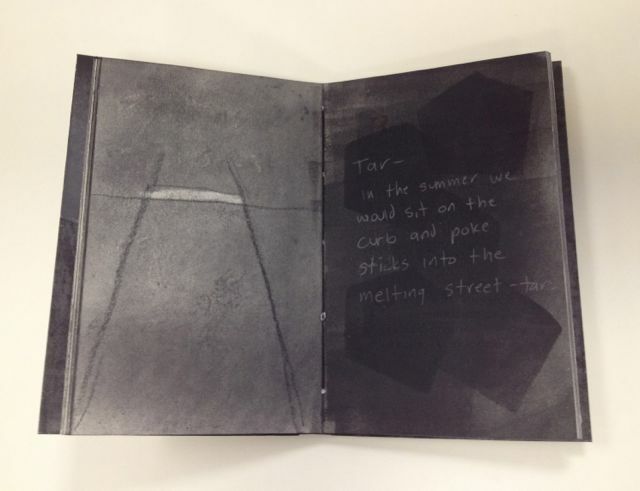 The book is fully compostable. A walk through the woods to the The Farm. 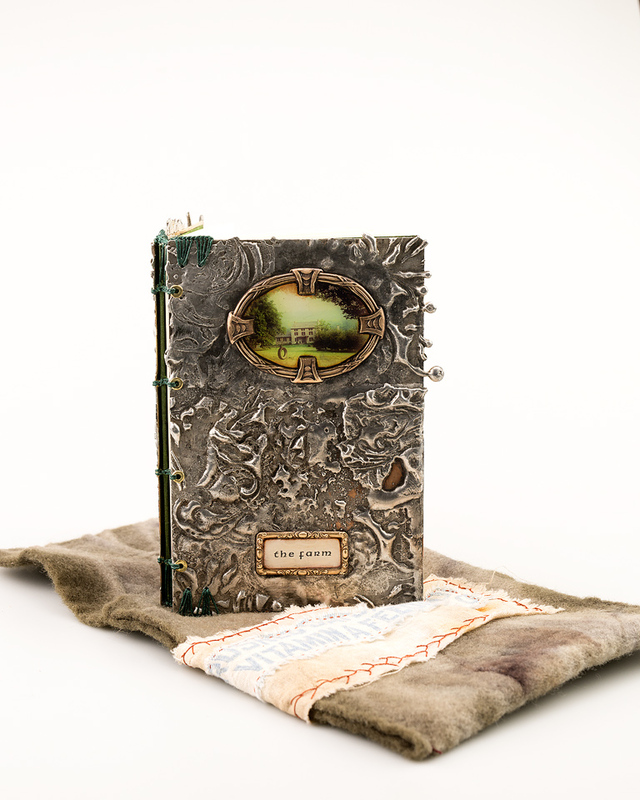 Leather binding with on-lays of leather and bamboo, a chemise wrap, both housed in a leather slip case embossed with hand painted book images, bamboo and leather on-lays, the binding designed to complement the naturalistic theme of the poem. 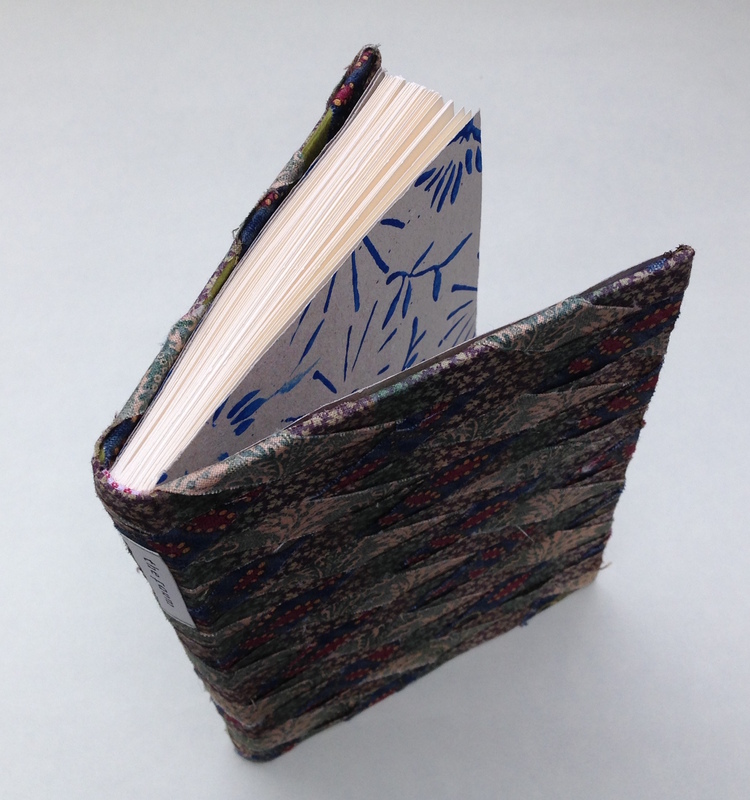 A double long-stitch sewing on library buckram. 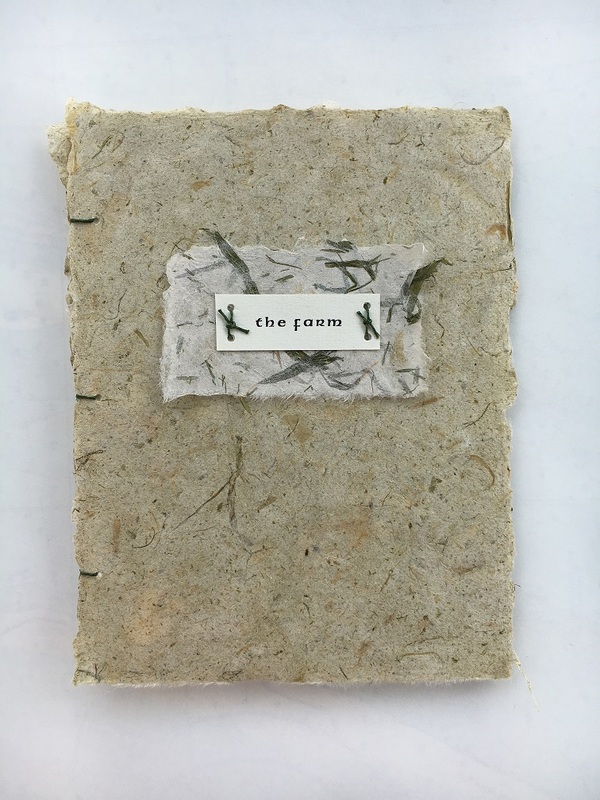 Design of foil tooling on Khadi handmade paper reflects the text, which follows the activities on a Kentucky farm through the seasons from autumn to autumn. 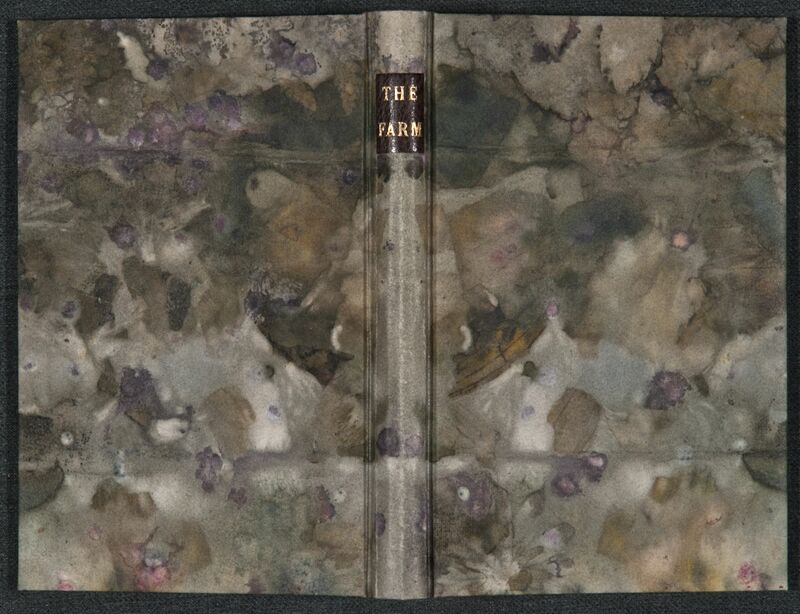 This edelpappband binding features pared leather at the head and the tail in two colors, representing the sky and the soil, and paste paper that reflects the look of the farm fields that the text describes. 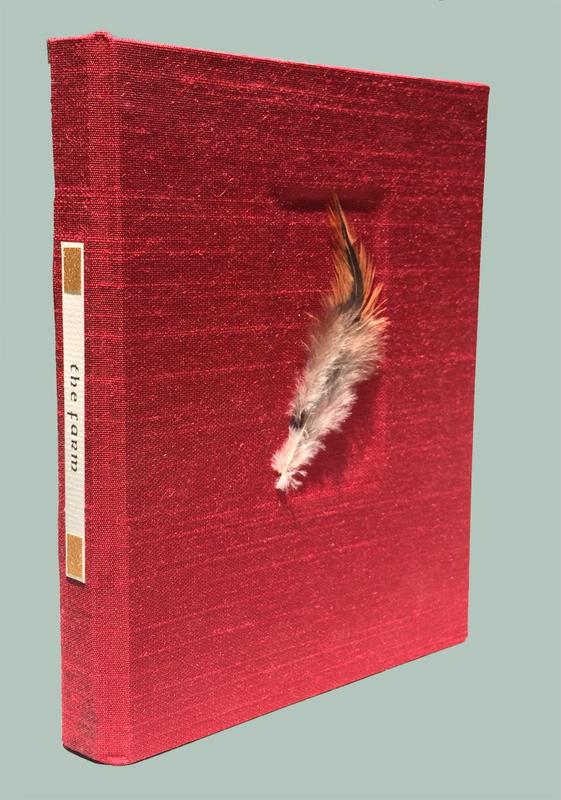 Bound in yellow goatskin with feathered goatskin onlays and surface gilding in gold leaf. Hand sewn headbands in polyester thread with end sheets from handmade paper. 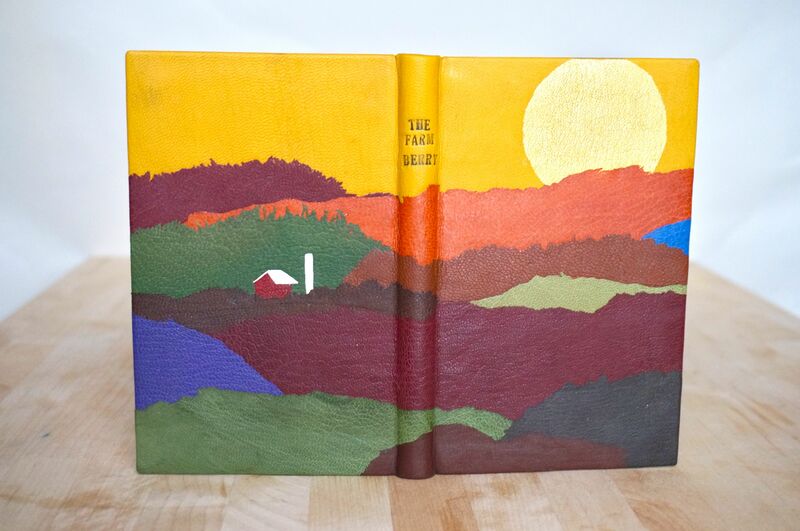 This binding is meant to show the expansiveness of nature, and the small (literally, in this case) place that the farm plays in it. I thought it would be fun to highlight what was on the inside and leave the outside rough. 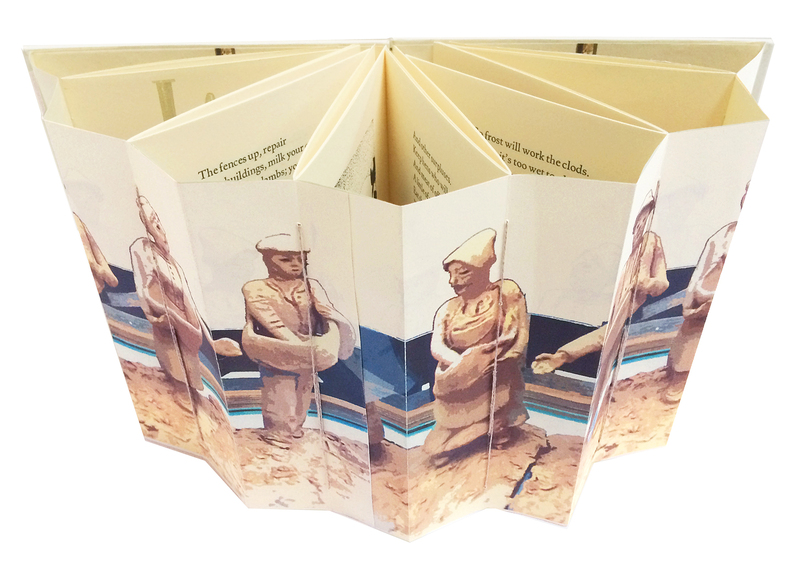 As a binder it is easy to get caught up in the structure and outward appearance of book. So I altered my book in a way, that really doesn’t let you judge it by its cover. 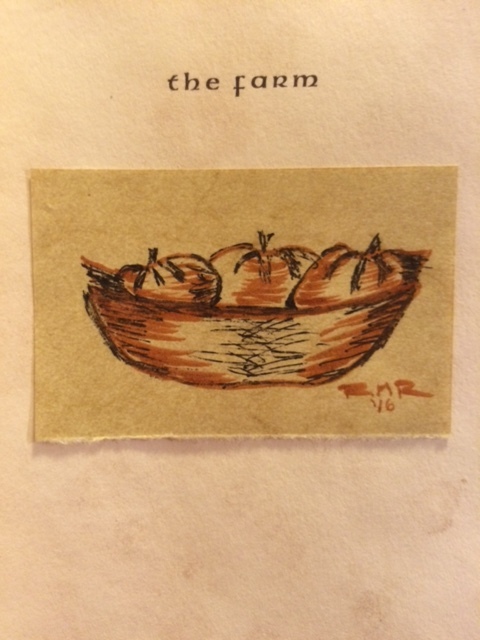 I hand water-colored each of the illustrations and included one paper element in each. Humanity is witnessing a crisis that’s unfolding on a global scale. It’s a slow burn, encompassing millennia both before and after the moment we currently inhabit. Things have slipped out of joint. I obliterated “The Farm” in order to re-examine my own relationship with nature, starting with childhood memories of place. 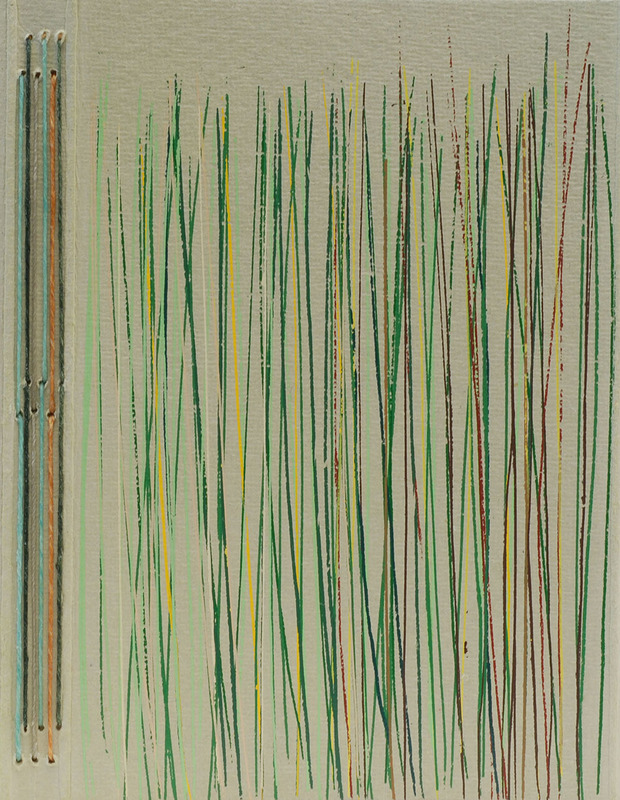 Acrylic and graphite. 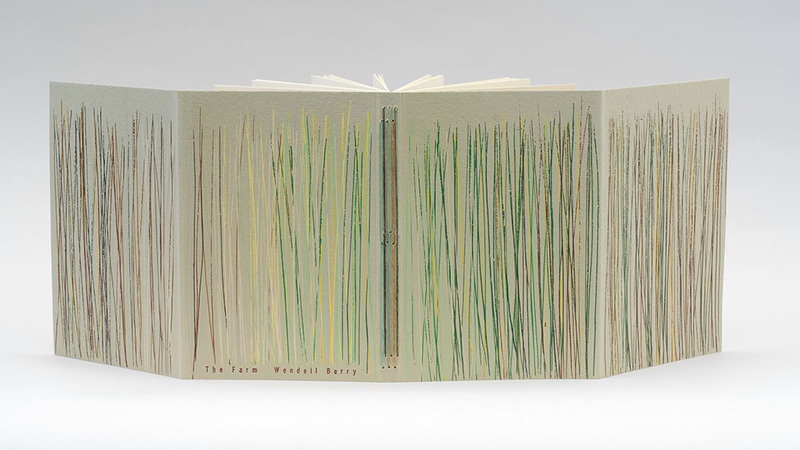 Emulating the text, I hoped to create a simple, elegant binding, in elementary colors of nature. The sophisticated, yet simple, Italian printed paper reminds me of cultivated fields; the deep brown goat, of earth. Wendell Berry’s poem evoked a nostalgia for a childhood spent in the woods, in love with every minute detail of the world around me. I could spend hours studying a leaf or a petal, mesmerized by the majesty in such seemingly simple things. I’ve lost this ability, as many do when they age. This project became an exercise in returning to the appreciation of the simple beauty that exists in nature. 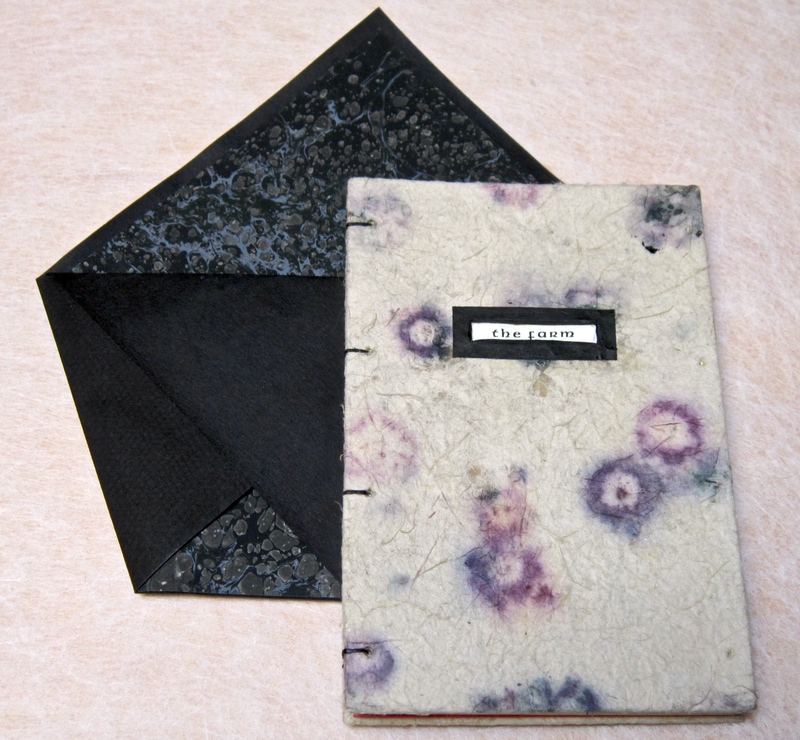 The paper used for the covers is made of cotton fiber with added natural plant material. I made the paper a while ago. 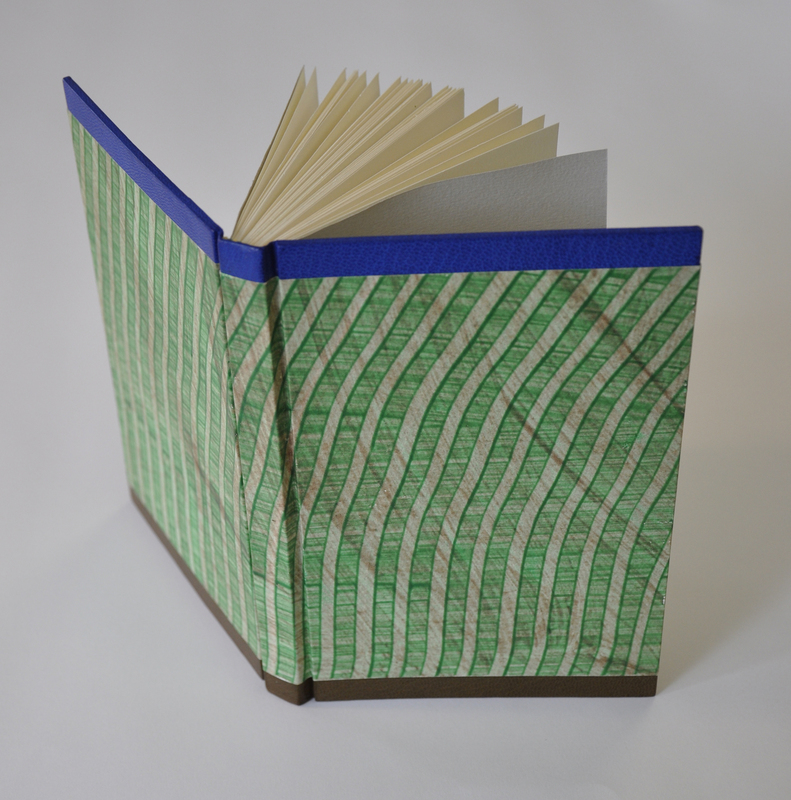 I sewed the book in the Coptic style and deliberately used only paper for the covers. I wanted the natural edges of the paper to show. 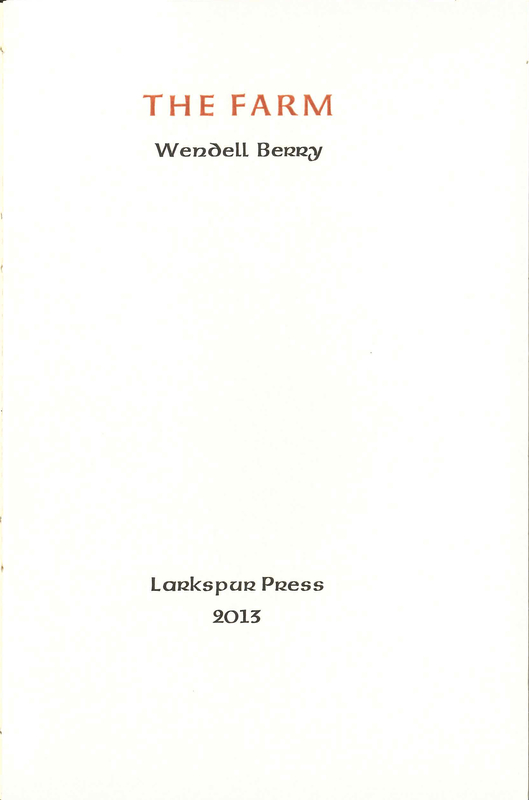 Berry’s work concerns Place, and he believes work should both come from and respond to this notion. 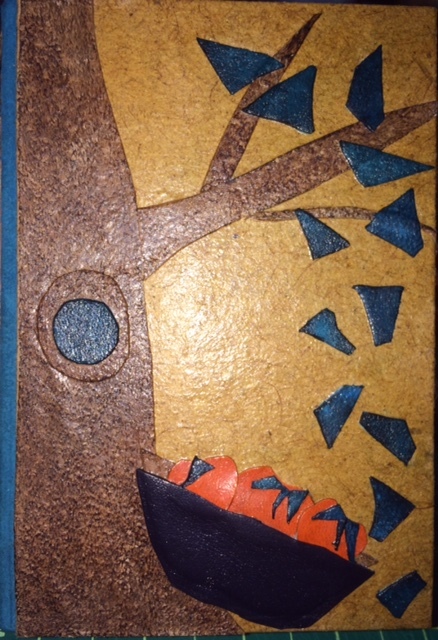 I wanted my binding to embody my Place as artist, as well as Berry’s Farm. 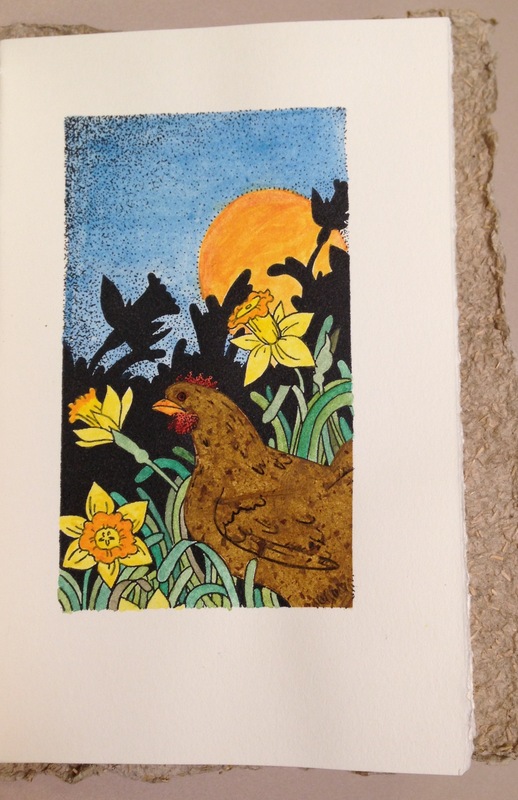 You’ll find linoleum block prints, dried flowers, silk embroidery floss, and handmade paper in my world. Come visit? 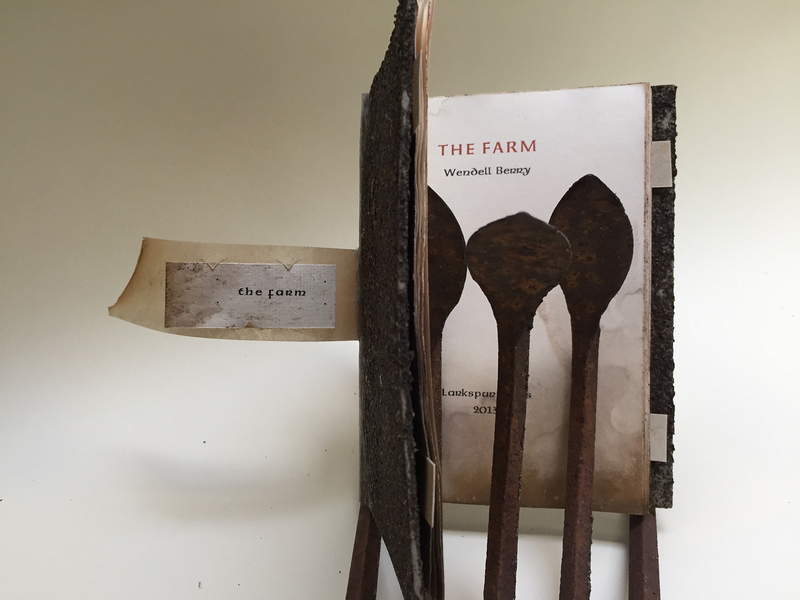 The covers I created for Berry’s “The Farm” were flooded with solder and stamped. 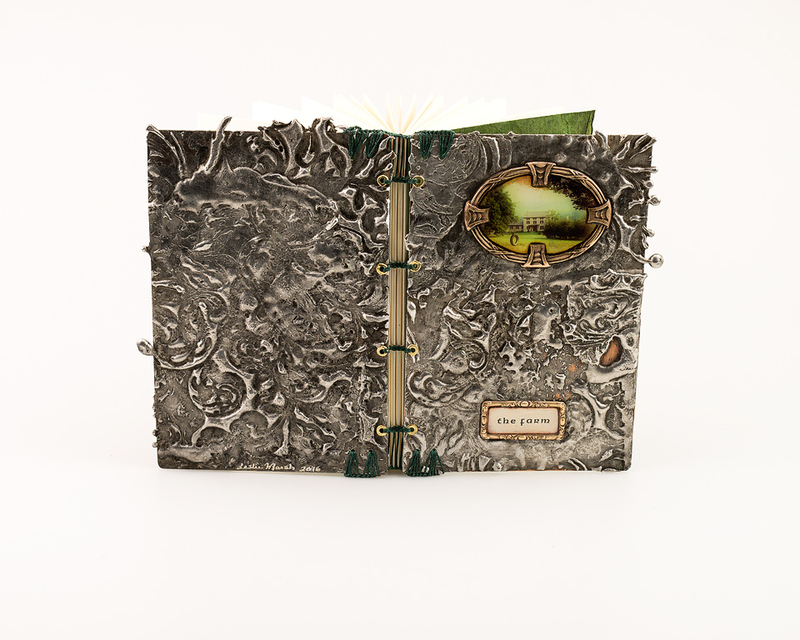 The front cover holds two vintage bronze frames. The larger frame is filled by my photo of the farmhouse at Wyebrook Farm in Honey Brook, Pennsylvania. When I read “The Farm,” this is the place I pictured in my mind. The first and last signatures are wrapped in green lokta paper. 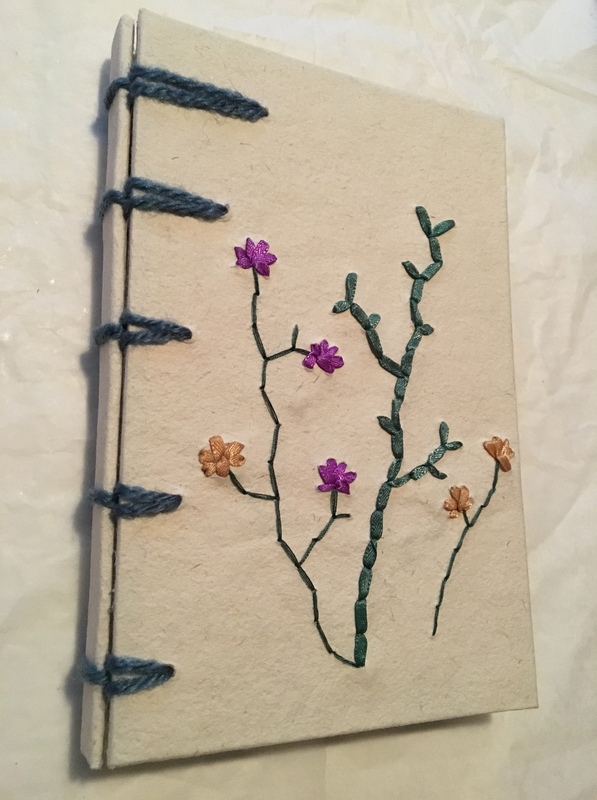 I bound the book using Coptic stitch. Found among beautiful descriptions of natural settings was the phrase, “Household economy. . .Never buy in a store what you can grow or find at home. . .” To me, this further describes the author’s outlook. I utilized what I already had. Historic-reproduction fabric scraps, then woven in a triaxial basketweave pattern. 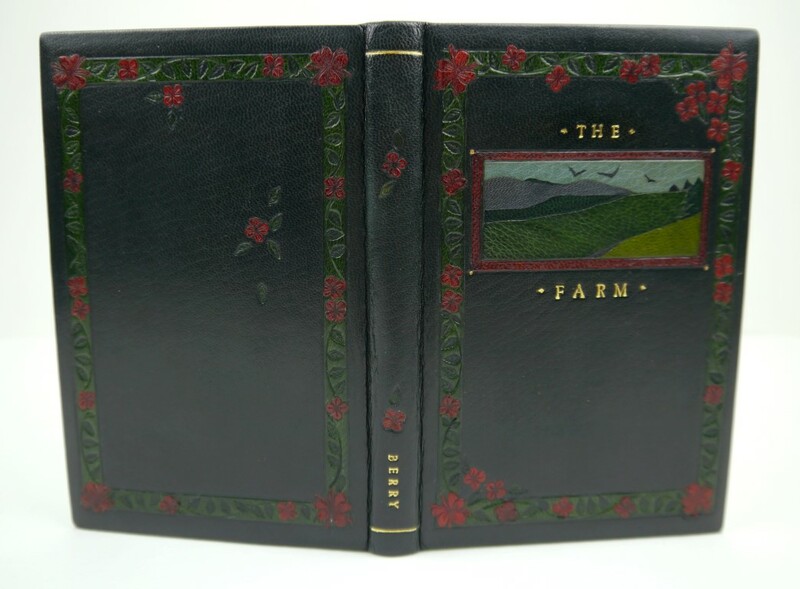 My binding of The Farm is a three-piece case binding variant, with leather trim at the head and tail. 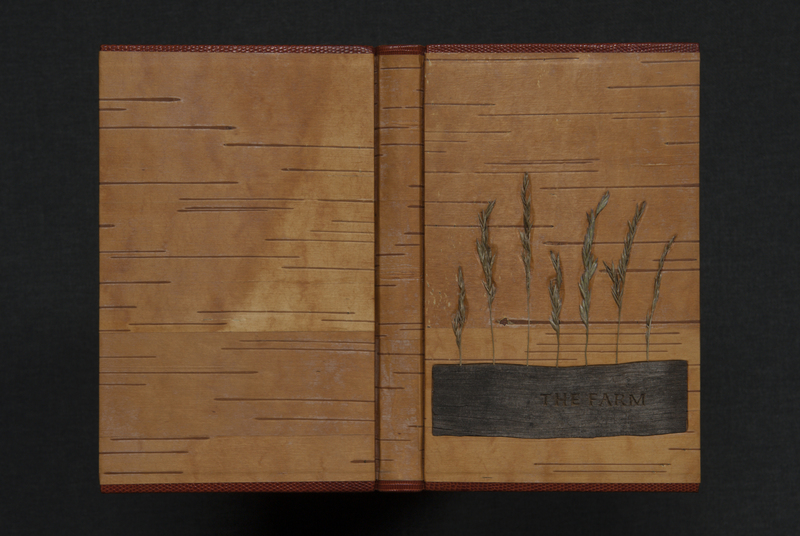 To reflect the bucolic setting of the farm I chose to cover and decorate with birch bark, grass stalks, weathered wooden panel, lizard-skin leather, and handmade endsheets with course fiber inclusions. 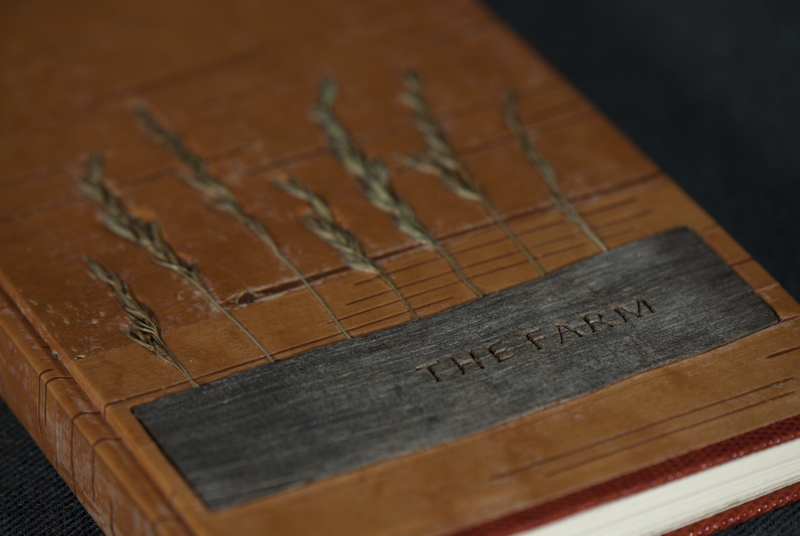 For the binding of this book I wanted to show the importance of decaying organic matter to farming. 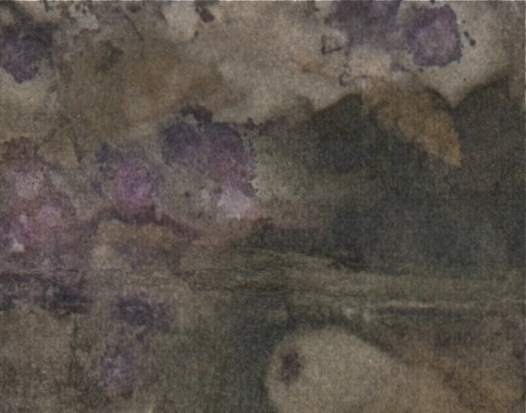 The covering paper is contact printed using a technique learned from Velma Bolyard in which the color and design is derived solely from direct contact with plants. 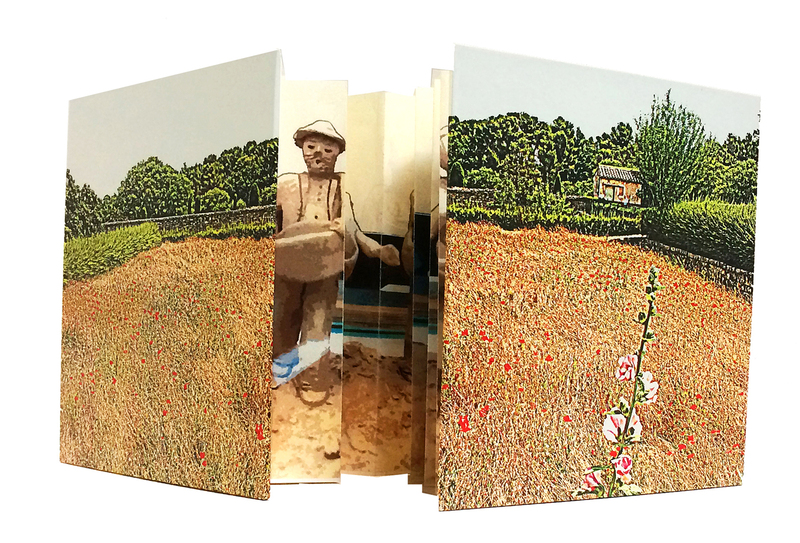 The images for the book were taken in Santarcangelo, Italy and Saint-Remy-de-Provence, France, where Van Gogh painted in the gardens and convalesced in the asylum. 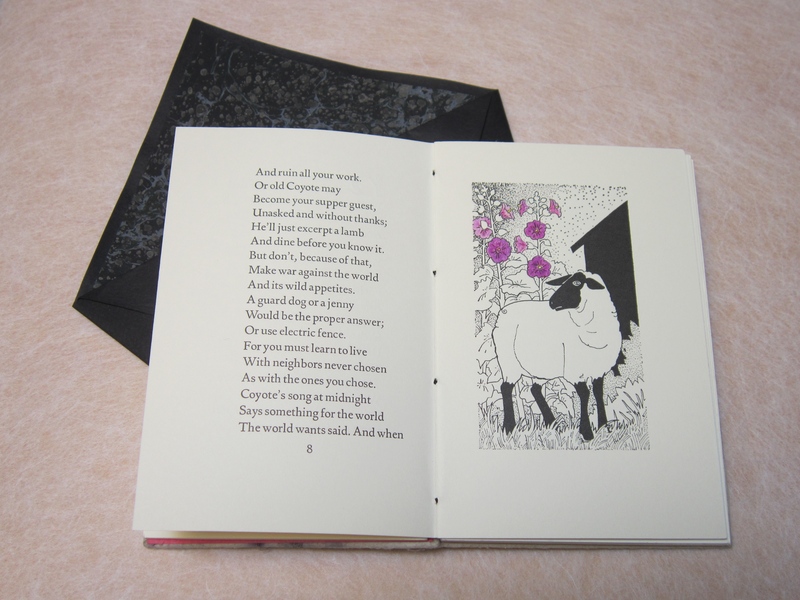 I thought these images reflected quietly on the poem. 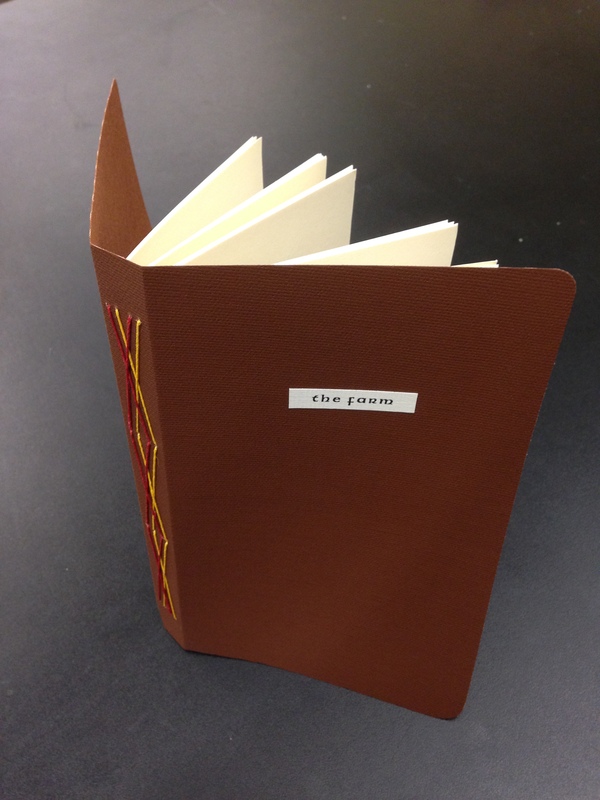 The book is bound in an expanded structure with board covers. Memory Press © 2016. I imagined that the sections of this book were a keepsake. An old but important keepsake to be bound for someone special. 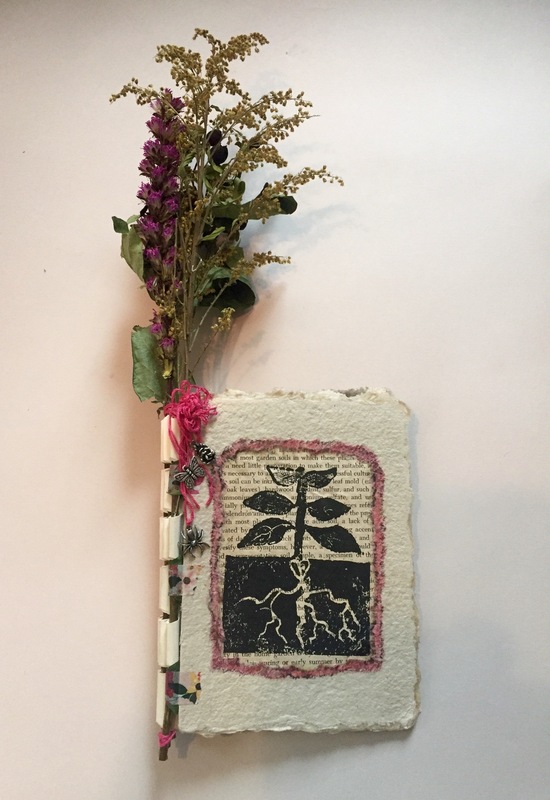 Thinking about that, I made a leather collage for the cover, dyed the sections with tea, made a small, quick sketch for the title page, added some minimal color to the images and sewed it all together with a decorative sewing. 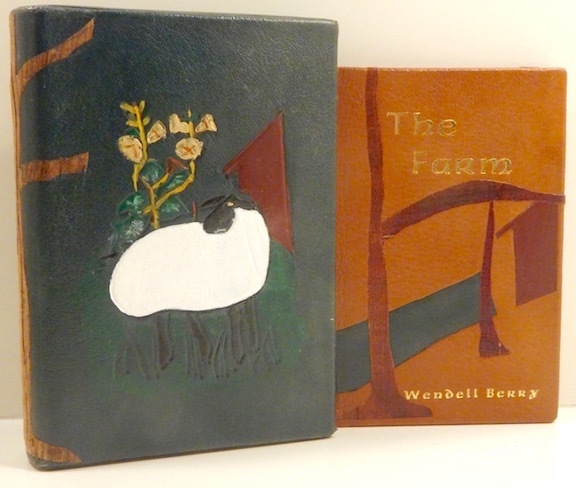 I enclosed the book in a small cotton sack to keep it safe and in keeping with the “Farm” theme. 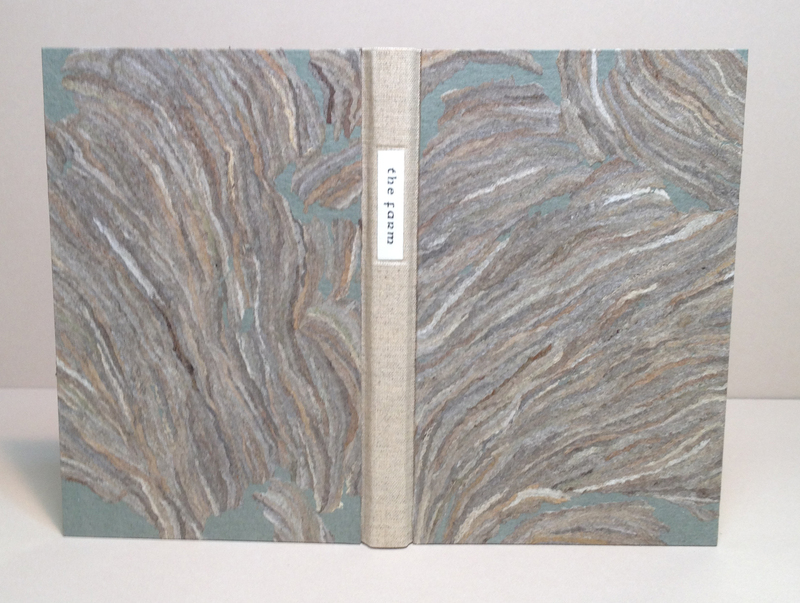 In keeping with the subject of natural surroundings, this binding has a linen spine and wasp nest “paper” on the covers. 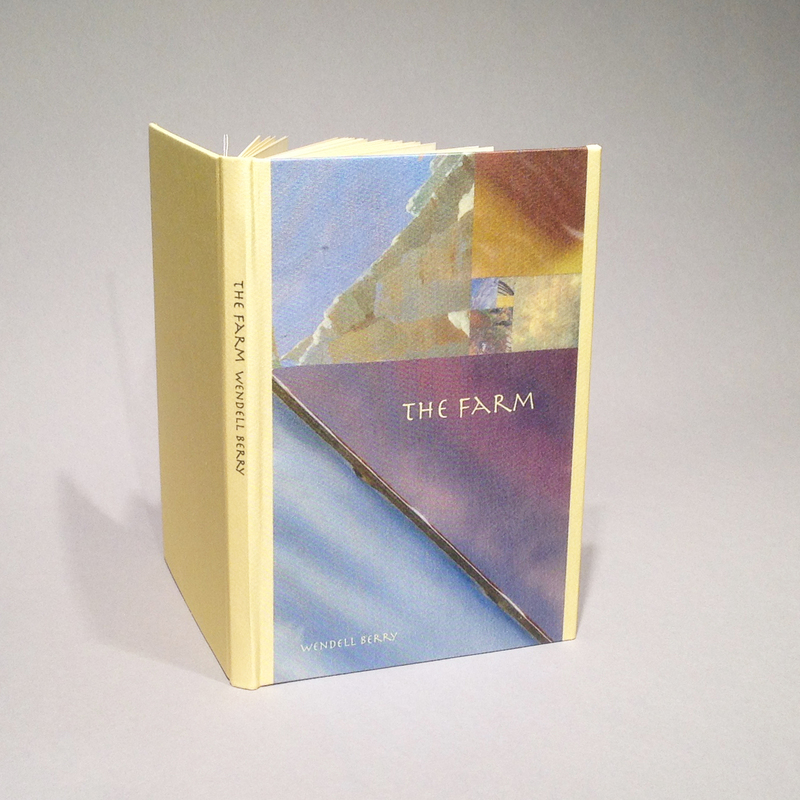 “The Farm” has a Coptic binding. Illustrations are colored with Prismacolor pencils. Only after the book was bound did I notice the connection between Berry’s name and the “blueberry” paper. 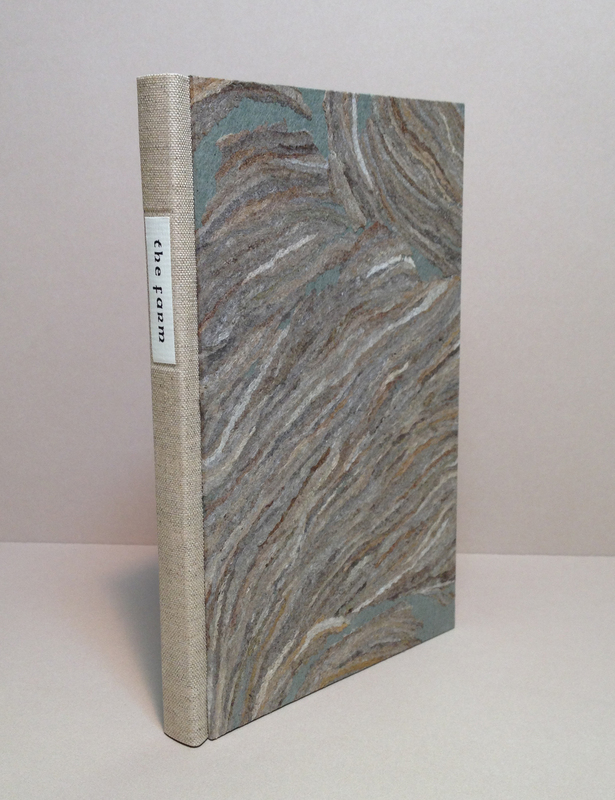 My cover design is a collage from recycled book covers. The composition is a linear echo of the Golden Section, a beautiful, spiral growth pattern found in many living things such as the petals of a flower or the bracts of a pinecone. 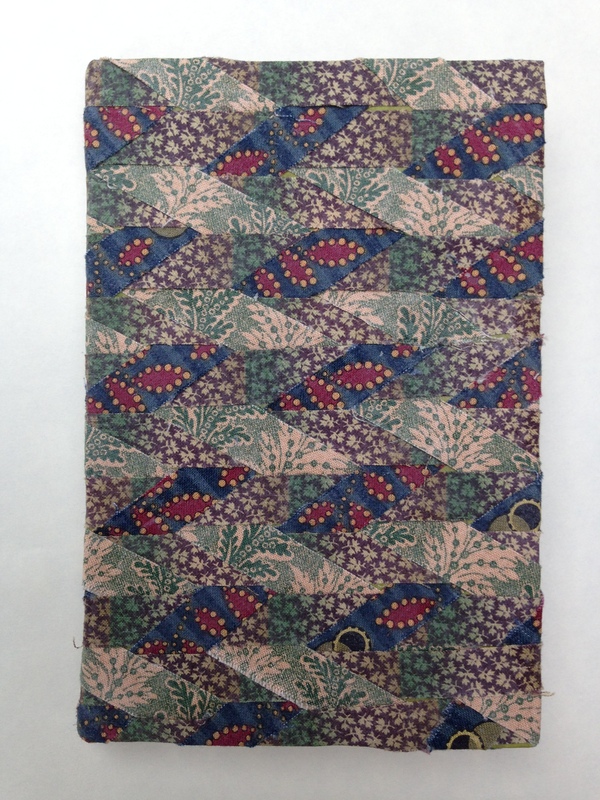 The collage was scanned and printed on silk book cloth at the University of the Arts, Philadelphia. 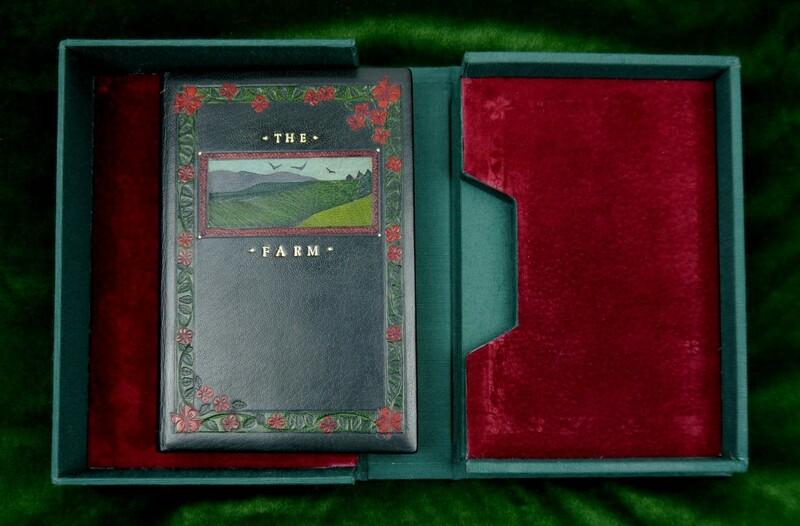 The Farm, bound with iridescent red cloth and a feather. My ex-wife said to turn the book into a bale of hay. 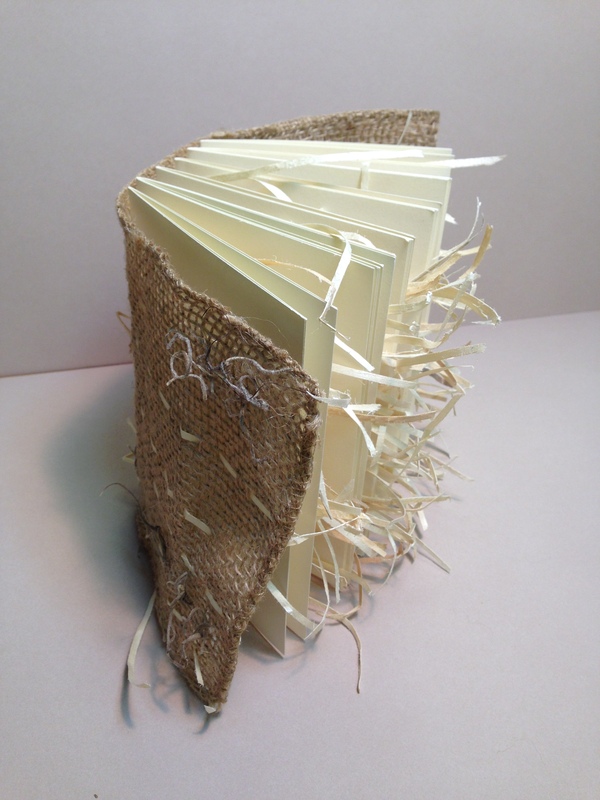 Materials: burlap; excelsior; Spanish moss. 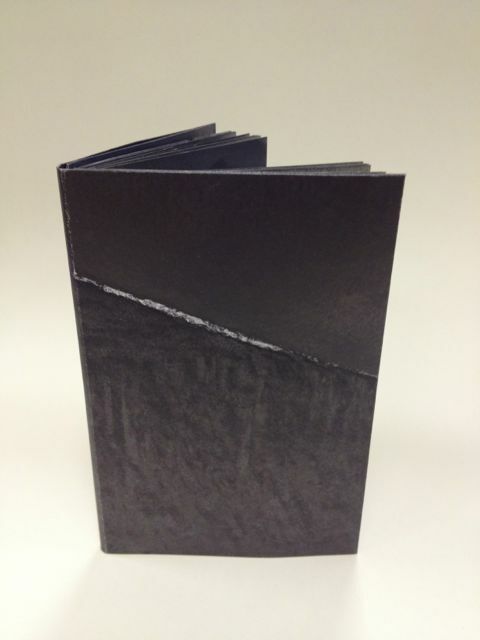 This volume was sewn on a support constructed out of unbleached linen laminated to Sekishu Japanese paper. The edges were colored red. French double-wound endbands were hand-sewn in silk. 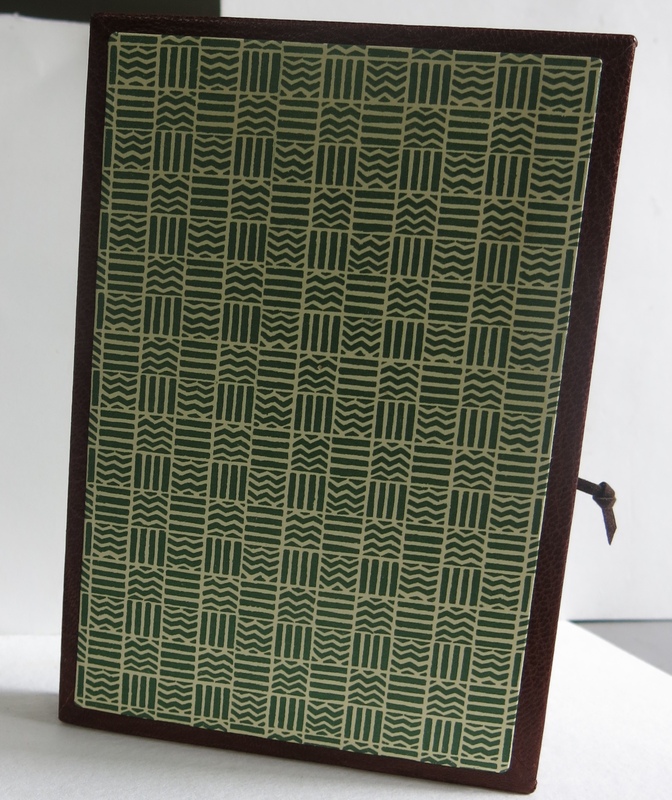 The binding is full Harmatan Nigerian goatskin, over cushioned boards, with leather onlays and blind and gold tooling.